This past weekend, I ran the Kirkwood Rotary Ramble 5K, and I set a personal record for my new running life in my 40s. However, the race was still hard. There were hills that proved my training route perhaps needed more challenge; the women I ran with seemed faster and stronger; the last half mile had me considering walking, which is something I have not done in years at a race. Then, I crossed the finish line, and I felt that sense of accomplishment that only comes from pushing through some kind of challenge and making it out on the other side. I signed up for my next race. My running partner and I agreed to tack on another 1/2 mile to our route to continue to build our stamina. To get better at running, like any skill, I need to do it lots. I need to keep stats, get feedback, reflect, and make plans to continue to get better. Most of all, I need to run more. Last week, I met with our middle school literacy specialists, a group of people who have one of the most challenging jobs I know: to help struggling readers push through their challenges and make it out on the other side. Reading, like running, is a skill, and to get better at it, readers need to read lots. They also need to keep stats, get feedback, reflect, and make plans to read more to get better. But, how do we get even better at helping students grow? W hen we began talking about designing our professional learning together this year, we held students at the center of the conversation. Referring to @laurasgt’s Periodic Table of Play and Play Deck, we talked about seeing the world of school through students’ eyes and understanding how they feel frightened, lack confidence, and often see themselves through the lens of a fixed mindset as poor readers. Part of our learning together, then, must address new ways to build a sense of determination and confidence in our readers so each one of them leaves us ready to tackle the new challenges ahead. Even after overcoming all of these obstacles, a reader can still feel like he is trapped in a game of Chutes & Ladders, so one of our goals is to show him ways to climb back up the ladder after stumbling. When we cheer on readers, we can get them to reach new heights and we can model for them how to keep moving, beyond their mistakes. Next, we built models of our current multi-tiered systems of support for students and considered how it feels to be students moving through these systems as a struggling readers. 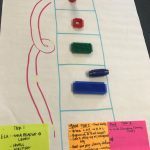 Our choices of representations (Chutes and Ladders and a rollercoaster) speak volumes about the hurdles our struggling students face on a daily basis. How do we best grow joyful and confident readers? How are we making every moment count in classrooms with our readers? What is our model for Tier 1 instruction? Tiers 2 and 3? How do these align with best practices? How do literacy specialists find time to meet with each other to research, to share thinking and successful practices, and to problem-solve? How can connecting literacy specialists to grade level team meetings help grow all students as readers across content areas? 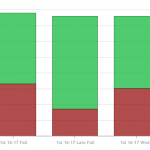 How does the timing of our class (90 minute block vs. 45 minute period) affect the structures and routines readers experience as part of their learning? How does that look when we try to balance fidelity to an online program with best practices in literacy instruction through small group work and conferring? 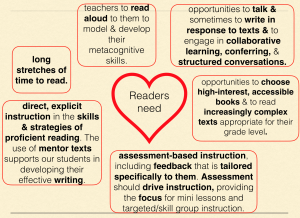 What are you wondering about literacy interventions at the secondary level? Join our conversation! Sometimes I have to write. The kids are in bed. I’m trying to sleep. My mind won’t shut off. Two days ago, I came face to face with a man who overdosed on heroin. I felt so powerless. I felt the urge to bubble wrap my kids, all our kids. Now that the shock is starting to wear off, I feel the need to do something different. It starts by sharing this experience with you and hoping the next step reveals itself to me after that. We’re at the corner of South Maple and Lockwood. Yes, I took the keys out of his ignition. That’s what you get for trying heroin. This past week I saw a video on Facebook that gave me pause. It wasn’t a political rant from either side of the aisle. It wasn’t a celebration of my friendship of 8 years. It was this video of a child’s school day, and it felt intricately connected to our work together this Friday, reflecting on the messages we send. We have the power to make school a safe, connected, and joyful experience for students. I see it in the hugs and high-fives you get on the playground after helping students navigate conflict, the shy smile revealed after connecting with a new student who is struggling to fit in, the way students walk with more confidence when you call them by name as they enter your schools, your hallways, your classrooms. How else would a student be able to share his love of puzzle-solving and connect it to a new love of reading pattern books in kindergarten? How else would a little girl be able to share that what is holding her back from writing is not word knowledge or mechanics but more the pain of her experiences and thoughts? How else could she talk through strategies to get her emotions and thoughts on paper to make sense of them? 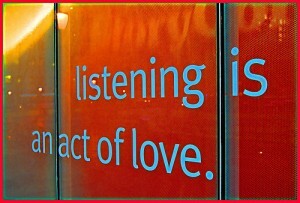 Listening is an act of love, and that message is one of the most important ones we can send to our students. 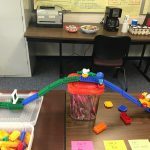 Over the past few weeks, I’ve had the chance to work alongside some amazing teachers as we make meaning of FastBridge data and how to use the data to guide instruction . 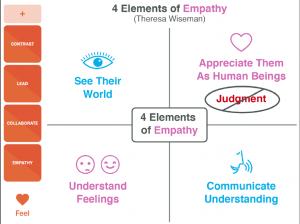 If you’re interested, below is a streamlined version of our process and some of the thinking that came from it to help those of you who are also trying to make meaning. Use the comments below to add your a-has and questions to keep our thinking growing! Who is on target to score well on high-stakes assessments at the end of the year (color-coded green)? Who is not predicted to score proficient or advanced on high-stakes assessments (red)? Research suggests students who score below the 40th percentile on these assessments will not earn a score of proficient or advanced on high-stakes assessments. These percentiles are tied to our multi-tiered system of supports, which we typically have indicated with red, yellow, green, and blue in previous years. This level of data alerts us to two new groups as well: students who are “on the bubble” of proficiency in the bright green band, and students “on the bubble” of scoring advanced in the army green band. 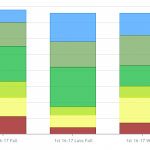 Click on any of the rainbow colored sections of the graphs above, and you will see a list of student names and their score ranges for aReading in that color group/percentile band. If you are a classroom teacher who is interested in growing your students into proficiency, you might begin by looking at your students who are in the color bands bright green (26-39th percentile) and yellow (11-25th percentile), and determining their score ranges. 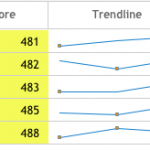 The example to the left shows a cluster of students whose scores range from 481-488. Next, use the aReading Score Interpretation Report to find “developing” skills for students in that range and form groups around those skills. In the list of skills marked as developing, you might choose to home in on one or two high leverage skills (think about skills that apply across content areas or are key skills for your grade level). In this third grade data set, you might focus on locating literal information or inferring a character’s motives or comparing characters. Your new Units of Study can provide you with small group lessons and conferring ideas that connect directly to your students’ needs who are below, on, or above benchmark. No need to reinvent the wheel–the lesson ideas are right there for you! Check out the Small Group and Conferring lesson ideas and plans in your current Unit of Study and see how they stack up against the needs you have identified for your students. Small group and conferring information for each session can be found directly after the minilesson. In Character Studies (Grade 3, Unit 3), for example, you can find ideas for supporting many of the skills mentioned above, like literal comprehension, inferring about a character’s wants, inferring about a character’s internal and external motivation, comparing two characters, and much, much more! If you are thinking about focusing on your conferring with students, these lesson ideas can be applied one-on-one as well. However, together with some very hard working teachers and reading specialists, we have culled high impact questions for conferring from Jim Burke’s Common Core Companion as well as Calkins’ Learning Progressions for Narrative & Informational Texts. We’ve organized them around the strands of your reporting criteria for reading. 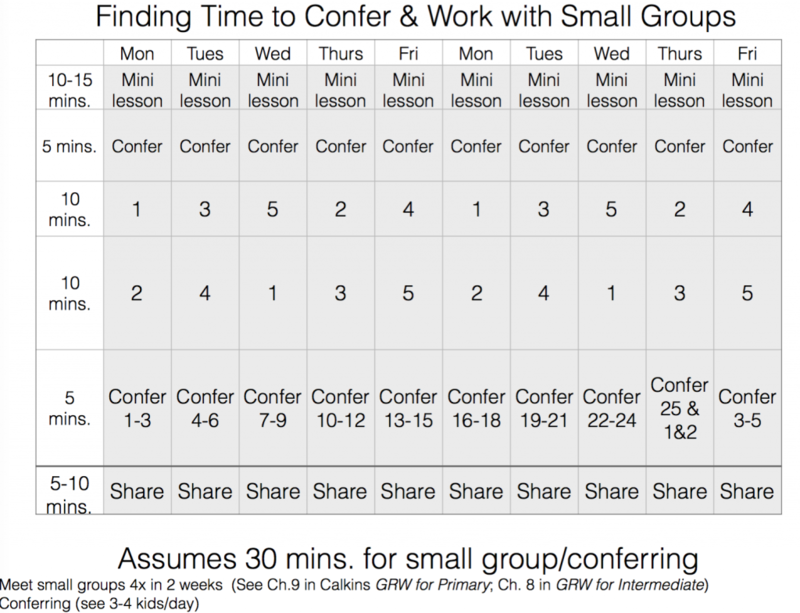 These conferring (& small group) guides can be found in eBackpack. Follow the path cohort folder>Reading>4-Prompting Guides by CCSS. Celebrate your students’ incremental growth, and don’t forget to celebrate your own growth as well. Maybe you shifted the language you use to confer to echo the language students hear in their minilessons. Maybe you found some small group ideas that seem just right for a group of your kids right now. Maybe you looked at your students’ data again and something clicked about how you can make great instructional use of it. 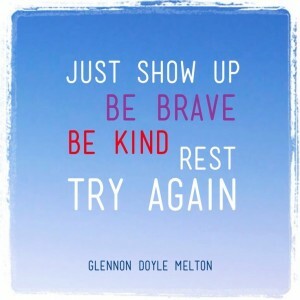 Maybe you reached out to a colleague for support in taking a next step together. Whatever your step, celebrate it! What does your process look like for planning with data? What a-has and questions have you or your team uncovered so far? We often lament the lack of reading that happens at home over the summer for our students. That summer slide can steal some of the gains students made in the previous year of instruction, and it leaves us feeling powerless. 7 minutes feels powerful. We can find 7 additional minutes hidden in our day for students to have their eyes on text, can’t we? But, it is not just having eyes on any text that counts. As Calkins reminds us early on in the Reading Units of Study: “The single most important method for moving kids up levels of text complexity is to be sure they read up a storm at their current level” (Reading Units of Study, Grade 4, Unit 1). Well, if you believe the research, which I do, students need to have their eyes on text for long stretches of time. And, they need to have their eyes on text they can read. Text that doesn’t prove to be too challenging or too simplistic. A just-right text. The best way to match readers to just-right texts is to know how they currently tackle the puzzles posed in complex texts. 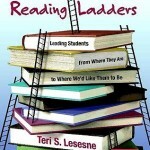 While we are in search of matching students to texts where they are successful instructionally and independently, often times the key to seeing where students’ cueing systems and comprehension within, beyond, and about the text begin to falter is in identifying the “ceiling level” of text that exposes their areas of needed growth as a reader. One of the tools we use in Kirkwood to gather this key information is the Fountas and Pinnell Benchmark Assessment System in K-5. According to Calkins, once we match students to texts where they are successful, we need to get them access to books–lots of them–to stop summer slide. This is why she suggests completing our F &Ps in grades 1-5 in the first week or two of school. I know what you are thinking: We have larger class sizes. The assessments take a long time to complete. 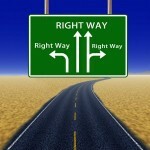 Sometimes we don’t really know how to use the information we get from those assessments in the most efficient ways. What if we started assessments with our most struggling readers and got them reading in texts matched to their levels as soon as we possibly could? What if we viewed these assessments as part of learning and teaching and not separate from it? Once we match students to texts at their level, they read, read, read. Following Calkins’ Units of Study for reading, she outlines mini-lessons that hone our instruction to key strategies and skills readers need to make sense of text, and she also highlights what struggles we might anticipate readers having so we can better prepare for small group work and conferring. Hiebert offers additional suggestions with 7 Actions that Teachers Can Take Right Now to help tackle complex texts. I’ve been on the waiting list for Mary Roach’s new book for months. So long, I actually had forgotten I preordered it until it appeared on my iBooks shelf. I had gotten lost in summer and fiction, discovering the universe with Aristotle and Dante, gifting the sun with teenage twins, and feeling the pull and pain of home alongside Ifemelu. The newest release by one of my favorite nonfiction authors. She aptly shares the whisperings of stories untold. 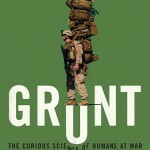 However, when Grunt: The Curious Science of Humans at War finally popped onto my shelf, I couldn’t resist peeking in to the first few chapters, and Mary Roach didn’t disappoint. With an opening detailing the chicken gun, Roach began pulling me into the world of military science. A world where “quiet, esoteric battles with less considered adversaries: exhaustion, shock, bacteria, panic” abound, and “scientists and surgeons, running along in the wake of combat, lab coats flapping” are left to design ways to keep people alive, not kill them. This lesser told version of military science already had me entranced, as great nonfiction is known to do. I wasn’t always a nonfiction fan; I firmly planted my feet in the realm of fiction if the truth be told. I would push through nonfiction, but I didn’t ever enjoy it, not fully until some of my KHS colleagues helped shift my attitude. Nonfiction texts like Covington’s Salvation on Sand Mountain and Roach’s Stiff began appearing on my desk. My access to high quality nonfiction changed, and with it, my attitude. Lucy Calkins, in her Guide to the Reading Workshop for Intermediate Grades, discusses the power of attitude and access in Chapter 13 “The Special Importance of Nonfiction Reading.” She urges us to “consider…ways to support reading nonfiction that allow students to see nonfiction reading as a magical way to pursue their own quirky personal interests, hobbies, and passions” (126). We also need to fill our shelves with irresistible nonfiction texts (see her ideas for texts on 127) and share our own readerly lives as we explore topics of our own interests with nonfiction/informational texts. Studying text complexity in nonfiction will make us just as adept at matching readers to nonfiction texts as we are pairing readers with engaging fiction texts. It can also help us better identify the puzzles nonfiction texts present as they become more complex. Calkins recommends collecting a “ladder of nonfiction texts representing increasing difficulties and study[ing] for yourself what makes one more challenging than another” (128). Skimming the chart describing these strands (70-72) and the visuals that explore each topic further (72-83) helps us anticipate the work readers do as they climb the ladders of complex thinking and complex texts. Coaching students to do this kind of heavy lifting in texts will be made easier with the prompts Calkins offers (in both the text and online resources for Chapter 5), which provide language for students as they work on exploring main ideas, structure, language and vocabulary in a range of texts. How will you help students better embrace the magic of nonfiction this year? I rid our bedroom of excess papers, books, folders, and more. However, the first load of laundry that finished at 10:00 pm on a school night, I decided maybe “just this once” I would cram some clothes in drawers and not worry so much about how that shirt “wanted” to be folded. Who would ever see inside my dresser drawers?! I wanted to sleep. 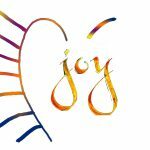 As a teacher, I often found myself in KonMari-like predicaments. I started off a school year with systems in place to support my goals: ways to track writing conferences, revisions, next steps for small groups and individuals, etc., but by December, some of those systems had fallen away. 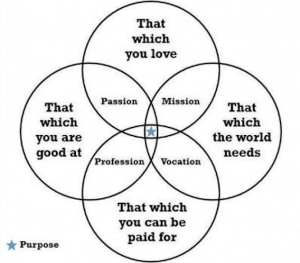 I was left with guilt and the drive to “do it differently” next year. In reading Calkins’ One to One: the Art of Conferring with Young Writers, she believes we forget or let go of record-keeping systems because often we don’t find them useful (36). We can become so busy with the work of filling up a records chart, that we forget to ask ourselves if we value what we are taking note of and if it will help students learn better or help us teach better. Record keeping should matter since it has the power to “channel the mindwork that will surround the split-second, on-our-toes thinking that we do as we move among children” (37). The forms we use have the power to focus our attention by requiring us to record whatever it is we want ourselves to notice and to think about as we listen to and watch kids (37). Records of conferences, small groups, and observations can reinforce “thinking as the currency of our classroom” and can help students develop their identities as readers, thinkers, and problem solvers. What messages do we want to send in our conferences with students: “Will we tell a single story, a story that holds out comprehension as an “it” that a student gets or doesn’t, that puts us in the position of knowing and the student in the position of not knowing? Or will we tell stories that highlight how students know what they know, showing them the dynamic, flexible thinking and problem solving that is the essence of reading” (Barnhouse, Readers Front and Center, 41). -As your teams design record keeping forms for conferring and small groups this fall, what values do you want reflected in them? -Check out the “Orientation to the Unit” for the first unit in Calkins. How might the section on “The Intersection of Reading Development and This Unit” (primary) or “Supporting Skill Progressions”(intermediate) help us notice and name the powerful thinking students are already doing in order to grow their thinking? Adapted from Barnhouse’s Readers Front & Center. Reading Workshop for Primary Grades (103) and Intermediate Grades (69)). If the purpose of small group instruction is to design the learning to meet readers where they are in terms of their complexity of thinking and the complexity of texts they read, then how can there only be one way to design that learning? However, if this is our only concept of small group work, one size does not fit all. We need to “outgrow any feeling that every small group proceeds in the same way” (Calkins, 72, Guide to the Reading Workshop for Intermediate Grades). -How can teachers use repeatable structures for small groups to reduce their time spent planning and increase their time listening to students? 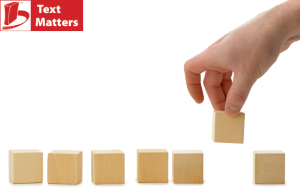 -How do we balance our desire to confer with our work with small groups? -How can we use Calkins’ tips in these chapters to shrink the time we spend with each small group and to create the time we want for conferring? We’d love to hear your thoughts as you dig into this one chapter in Calkins’ Guide to the Reading Workshop for your grade level. 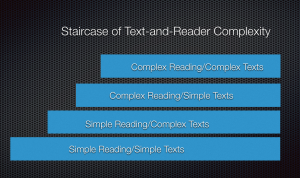 In this chapter, “Teaching Smarter: Stepping Students Up to Do More Complex Thinking in Independent Reading,” Barnhouse digs into the Staircase of Text Complexity. She argues focusing solely on the text as the way to measure complexity encourages teachers to take their eyes off their students: a dangerous practice. Instead, teachers should “notice and name what students are doing” and grow their thinking (67). This idea of homing in on student thinking permeates my own thinking about teaching and learning. If I truly value others’ thinking, how does my teaching time reflect that value? How do we slow down, be present, and listen? Because we value student thinking, we value their development of that thinking. 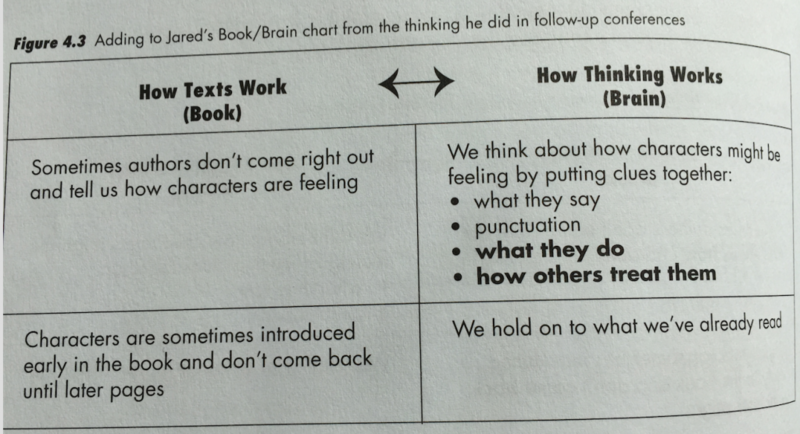 To nurture the complexity of their thinking as readers, Barnhouse contends we should start with helping students see the thinking they are already doing in their just-right text and what that thinking allows them to know and do. Using a book-brain chart like the one below, Barnhouse helps kids understand and see how books work and how their thinking helps them unlock the puzzles books present. 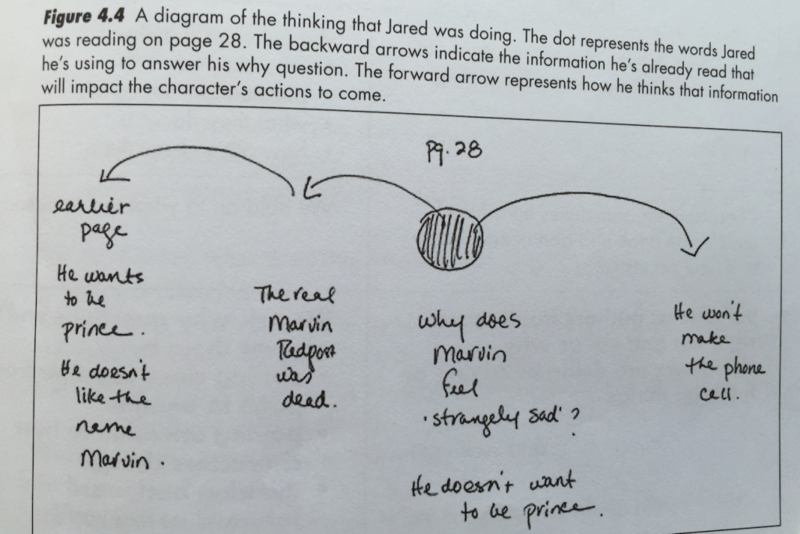 In her conferences with a reader named Jared (captured below in the chart), she began by noticing how he made inferences about a character by paying attention to dialogue and punctuation across lines. The classroom teacher shifted away from teaching inferring as an isolated skill of what the text says+ prior knowledge+consider what makes sense=inference to helping students see it as something readers do continually as they read, connecting details and asking why questions about what the characters were doing, saying, and thinking (74). In the next conference with Jared, the teacher noticed he made inferences using details about what the character was doing and how others treated him, so she added those strategies to the book-brain chart. Getting students to make inferences across multiple pages builds from their asking why? Barnhouse provides a diagram she sketched of Jared’s thinking during a conference with him. 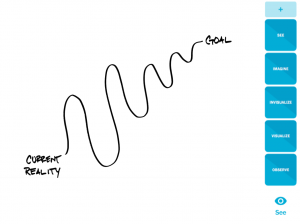 This diagram attempts to help Jared visualize the thinking he is doing across pages with the intention that he will then be able to repeat it. Most importantly, Jared has the chance in this conference to see how this kind of complex thinking helps him better understand the character and the story. Finally, to sustain that thinking in more complex texts, we need to ask students about the patterns they notice. We need to pose lots of questions around why those patterns have developed and how they may have evolved over time as well as what the readers make of those patterns. This teaching stance requires slowing down, being present, and truly listening. What can we let go of to invest our time in what we value? What do we need to be able to adopt this stance?